I can’t believe that as I type these words it’s still technically winter and yet the mercury reads in the mid 70s Fahrenheit. Talk about a season getting flipped on its head. It feels like the final nails in the coffin of the winter that never was. That hasn’t stopped us from making hearty—and in this case—rustic dishes in the kitchen, however. We open the shutters, let the light pour in, open the double-hung window, and enjoy a light breeze and some fresh air in the otherwise dark, cramped space that comprises the kitchen in the house we’re renting at the moment. 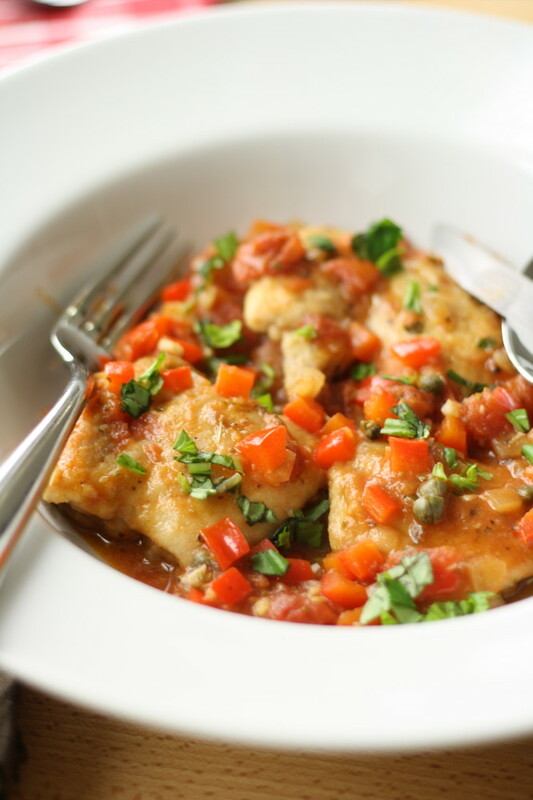 Maybe it’s my Sicilian heritage speaking, or perhaps just a simple food craving, but in recent weeks Italian has figured prominently in our weekly meal planning. 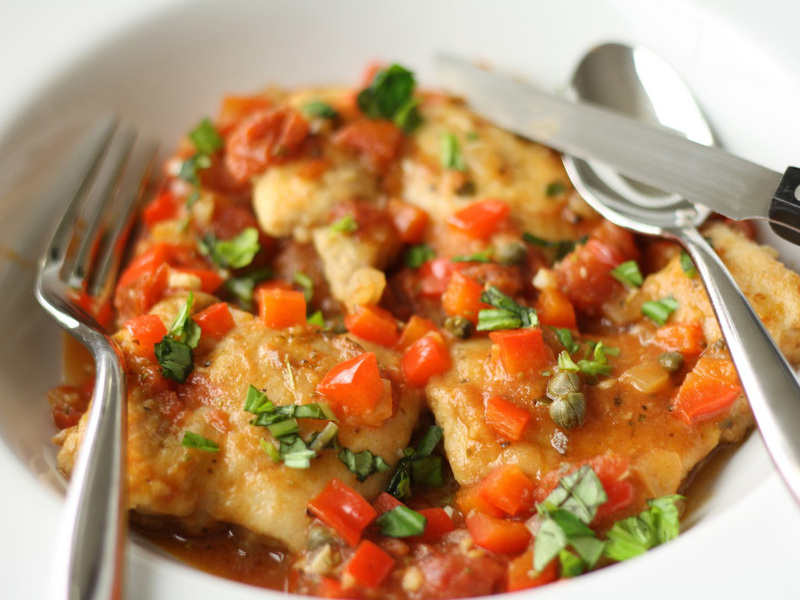 Most recently, we made this bright, flavorful, and classic chicken cacciatore. “Cacciatore” means “hunter” in Italian, and in cooking often—though not always—refers to a meal made with braised chicken. Some versions use white wine, others red. Some have capers, some not. 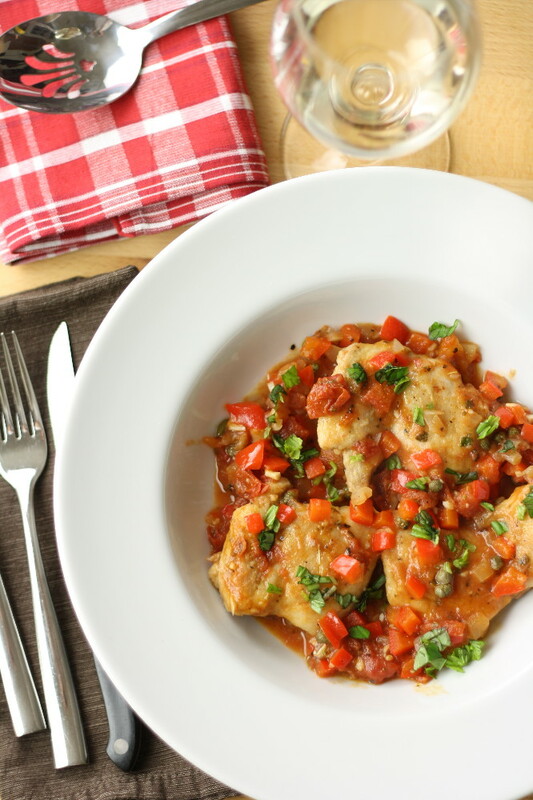 Our version combines braised chicken thighs with tomato, pepper, onion, white wine, and dried and fresh herbs. The result is a dish layered with complex flavors that sing on the tongue. 1. In a bowl, season the flour with some salt and pepper. Heat the olive oil and butter in a skillet over medium-high heat. Dredge the chicken thighs in the flour and cook about 5 minutes per side, to lightly brown the chicken and cook most of the way. Remove the chicken. 2. Add the garlic to the pan and saute until fragrant, about 30 seconds. 3. Add the pepper and onion and saute until soft, about 4 minutes. 4. Add the white wine and simmer, about 4 more minutes. 5. Add the chicken broth, tomatoes, and dried herbs (oregano, rosemary, bay leaf) and bring to a simmer. 6. Add the capers and chicken, reduce the heat to medium, and cook the chicken until done, about 10 minutes. 7. Remove the bay leaf. Garnish with fresh basil. Serve with rice. Though we used our signature flour blend to dredge the chicken, you could substitute most any GF flour or flour blend to do the job. This recipe is: gluten-free, egg-free, fish-free, shellfish-free, tree-nut-free, peanut-free, soy-free, refined-sugar-free. To make the recipe dairy-free, omit the 1 tbsp butter and use additional olive oil. Per serving (excludes rice): 351 calories, 15g fat, 31g protein, 19g carbs, 325mg sodium, 4g dietary fiber, 0g sugars, plus 750mg potassium and at least 140% RDA vitamin C, at least 60% RDA vitamin A, at least 40% RDA manganese, at least 30% RDA vitamin B6, phosphorous, and selenium, at least 20% RDA riboflavin and zinc, and at least 10% RDA copper, folate, iron, magnesium, and thiamin.